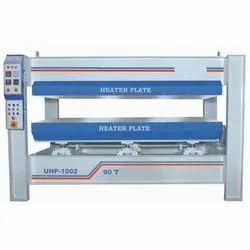 Leading Manufacturer of uhp 1002 hydraulic hot press from Ahmedabad. We grasp expertise in making quality products, we manufacture a UHP 1002 Hydraulic Hot Press using high-quality materials coupled with modern technology. It contains the uniform temperature on whole press. it has a longer working capability, high efficiency, and trouble free working at zero maintenance cost. Generally, this product is used in Indian international woodworking industries.